A supercar is always better without its roof. 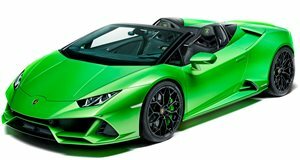 Shortly after Lamborghini announced the intense 640 hp Huracan Evo a few months back it was only a matter of time before the drop-top version joined it. That happened merely a month later in February when the Huracan Evo Spyder was announced to the world. Now that we have finally seen the real deal at the Geneva Motor Show finished in acid green or ‘Verde Selvans’ paintwork, the Evo Spyder is every bit as stunning as its hard-top stablemate. While it retains the same deep front spoiler and side skirts, the most noticeable changes are of course to the rear of the car where the electrically operated roof is situated. It can be operated at speeds of up to 31 mph and takes just 17 seconds to open. The rear window can also be operated independently of the roof which allows that 5.2-liter naturally aspirated V10 to permeate the cabin with its intense sound. The Evo Spyder does without the huge rear wing that you find on the back of the Huracan Performante Spyder and we think that the smaller integrated rear spoiler suits the car’s lines better. Lamborghini was kind enough to follow up on its earlier Huracan Evo video with a sequel which showcases the new Spyder on some amazing roads. Compared to the original Huracan Spyder, the Evo features notable improvements in every area from driving dynamics to its quieter cabin and advanced new 8.4-inch touchscreen. Just as in the hard-top Evo, the Spyder features an updated active suspension system with and a four-wheel torque vectoring system that can transfer power to just one wheel if required. The aero improvements reportedly provide the car with up to five times more downforce than the first-generation Huracan. Opting for the Evo Spyder over the coupe model does add around 265 pounds to the overall curb weight, although Lamborghini says that this does little to dampen the car’s performance capabilities with the 0-62 mph time taking 3.1-seconds (just 0.2-seconds slower than the Huracan Evo) while top speed is the same for both models at 201 mph, presumably with the roof closed. Deliveries for US customers are expected to begin just in time for spring. Prices start at $287,400 before options.